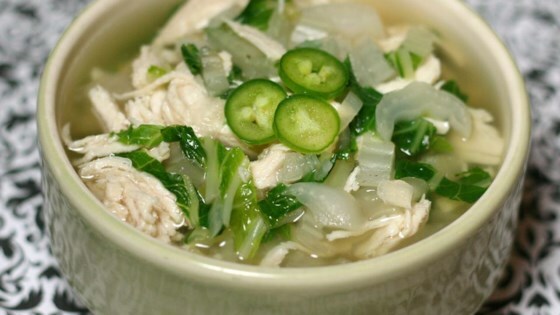 Combine chicken broth, water, onion, jalapeno, ginger, and garlic in a large pot; bring to a boil. Add chicken breasts; cook until no longer pink in the center and an instant-read thermometer inserted into the center reads at least 165 degrees F (74 degrees C), 15 to 20 minutes. Remove chicken from the pot. Cool until easily handled, about 5 minutes. Shred chicken and return to the pot. Stir in bok choy and cook until wilted, 3 to 5 minutes. Season soup with salt. Substitute a serrano pepper for the jalapeno if preferred. You can use baby or regular bok choy in this recipe. My wife liked it a lot. I didnt have jalapenos so Iused ground cayenne pepper. This was the perfect solution for too much bok choy in my garden. I am not a big jalapeño fan so I substituted a teaspoon of roasted sesame oil. Perfect!! this was yum! I followed the recipe. My jalapeño was nice and hot. Very easy. Very good! Great low calorie soup! This was my first introduction to Bok Choy and it was delicious! Thanks for sharing!